President Trump is reading directly from his campaign script and ensuring that within the first 100 days in office he has kept all his campaign promises aimed at “Making America Great Again”. 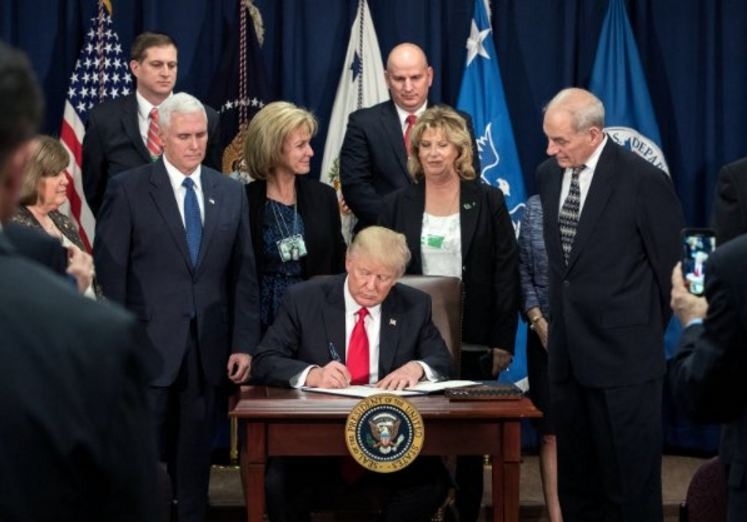 Since he set foot in the Oval Office after the inauguration, President Trump has been signing executive orders almost each day; some which are becoming enforceable immediately while others need Congress hearing before they can be passed into law. Among the latest executive orders that President Trump has signed is one calling for the Treasury secretary to review the 2010 Dodd-Frank financial oversight law. “The Dodd-Frank Act was passed into law in 2010 following the 2008 – 2009 global financial crisis that emanated from poor regulation within the US financial sector. This compelled the legislature to enforce strict regulation to avoid a repeat of the same grave mistake that had its negative impact felt across the whole world,” an analyst from Stern Options explained. However Trump administration officials and a section of other critics are of the opinion that the Dodd-Frank Act in its current state is very punitive to the financial services sector and it has not lived to achieve its objectives 5 years later. President Trump’s executive order therefore requires the Treasury secretary to consult with other relevant bodies and agencies including the Financial Stability Oversight Council and report back on potential changes to the regulation. or investors who have stakes in banking stocks in the US this comes as good news since lesser regulations means that the banks will be able to do more business and increase their profits from transactions they would have not done under the Dodd-Frank Act. In addition, lower corporate taxes as promised by Trump during his campaign will be another boost to the banks financial performance; hence investors are looking forward to brighter days ahead. To make the deal even sweeter, President Trump’s planned fiscal stimulus package is expected to push interest rates further up and this adds to the good news for the banks under Trump’s administration. Proponents of the Dodd-Frank Act argue that the regulation brought back sanity within the financial services sector in the US and the positive economic recovery across the world. They claim that with the regulation in place, the banking system was made safer and sound; ultimately protecting the customers from abuse and exploitation by the bankers while they made billions from the customers’ savings and loans. Analysts supporting the amendment of Dodd-Frank are on the other hand arguing that there need to be a balance between protection of customers and the need to attract capital in order to return a reasonable return to shareholders. Those subscribed to this school of thought claim that too much regulation creates red tape that inhibits economic growth and development in the long run. In their views, with too much regulation, the financial services sector will not be able to explore new products and services for their customers. This will limit credit accessibility, which in the end will result to lesser jobs being created and a decreased pace towards individual prosperity for the potential borrowers. As it stands right now, the regulator and its agencies has all the authority to determine cases arising from the financial services sector; and the bankers do not believe that there is an objective, fare and clear process to be followed in case of disputes. The problem arises since the regulator is the prosecutor who initiates the process and when the banker wants to challenge the matter the same regulator acts as the judge and jury. In such a scenario, any appeal will always be stacked against the accused. In some cases, the dispute may be referred to an internal review committee or to an ombudsman who again reports to the head of the agency. In the event that the appeal process referred to other agencies ends up in favor of the accused, still the final decision has to be made by the same regulator who initiated the process. This makes the whole process appear to lack any form of fairness or objectivity when viewed from the perspective of the bankers. As the Treasury secretary consults with relevant bodies and agencies on the changes to make to the Dodd-Frank Act, it is expected that the end result will not dilute the regulation to the extent that reckless lending such as the subprime mortgages will be allowed back into the financial services sector. A possible solution will be to create an independent panel of five members of whom two are drawn from the banking industry, two from the regulatory agency and one from the general public. This would go a long way in ensuring the dispute resolution process is objectively carried out and the interest of all parties concerned are taken into account.